You can get a library card for FREE! If you have a library card you can check out materials in any library in Allegheny County and return materials to any of them as well. What type of materials can I check out with my library card? You can borrow books, magazines, DVDs, CDs, and any audio books at the library. You are also able to borrow & download FREE eBooks. And you are able to stream and borrow movies, music and magazines with your card. We also have a number of databases that are available to you with your card as well. What do I need to sign up for a library card? You must be a resident of Allegheny County or have an Access Pennsylvania Library Card. Please do not apply for a card if you already have one, if you have overdue items, fines or if your card has been lost or stolen. Contact your local library if you already have a card. Please be prepared to provide a current photo identification with proof of address when you pick up your card. A signature is required from a parent/legal guardian when picking up a library card for a minor. 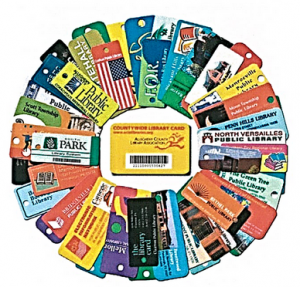 Visit any Allegheny County Public Library to pick up your permanent library card. Your card does expire every two years. We like to make sure all of your information is up to date. Visit your library if you need to renew your card. You can sign up at any library in the county to sign up for a card. Find your local library, print out this form and bring it to the Baldwin Library or you can register online by filling out the form and you can pick your card up at any local library.